Small space office ideas. I know this is scary but I wanted to show you what I am working on. I don't have room for a home office anywhere. This has been the place for our desk top and printer and it sits in the corner in an L shaped hallway. I am declaring it mine. I want to re-do it for more efficient space for me to have as my own. I will keep the desk and the desk top computer. I have convinced the two oldest to set up the printer in their room. They have two desks in there and lots of space and they also use it the most. The wall color will stay the same is I don't want to repaint the entire hallway right now. I hate all those cords you see walking down the hallway. I have begged hubby to make it a project for himself to figure out how to hide them all. The shelves are going in my third daughter's room. She wants a couple shelves for books and mementos so these will be perfect. Here are some inspiration pics all from bhg.com. Just love the colors and all in the above photo. I love this entire set up. They have truly maximized wall space here and I am on the hunt for a hanging unit like the one on the left. I just love this photo for the colors. Of course I cannot really use these colors but how cheery they are. I could sneak in some pretty paper products that would make me smile for sure. On a side note my daughter and I have been so busy and stressed trying to get her registered in her college classes for the coming semester. This is her third semester and yet this has been the hardest time we have ever had. Continual budget cuts and an increasing student population have made it so difficult to get into any classes before they are filled. We are waiting for confirmation that she was able to get a spot into her last class. We had to go through five attempts to even get her into one class as everything was already filled by the time she could log in. I need chocolate bad!!!!!!! Yeah she just yelled back to me that she got the last class. Whew. You will be so happy when it's finished! Looking forward to seeing the end result. Did you see the cords in a shoe box on Pinterest....?? I emailed the picture to you....I will try...I don't know how to Pinterest it to you if it is possible...but I think you can figure it out...I thought it was clever! It looks lovely! I like your inspiration pics, too. Looks like fun. I found you from the Cozy Little House. I've had good luck checking the 'bump and dent' section of Ikea. I recently got a desk top for $2.98 there! If you think outside the box, you can do some interesting things with cheap Ikea stuff! What a fun project!!! You could have big fun doing that area! Yea for your daughter getting into her class!! First ...YAY! on the college stuff. My youngest is going back next week...so that means the boy(LITTLES) will be coming to Oma's house 2 mornings a week...AND 1 AFTERNOON! 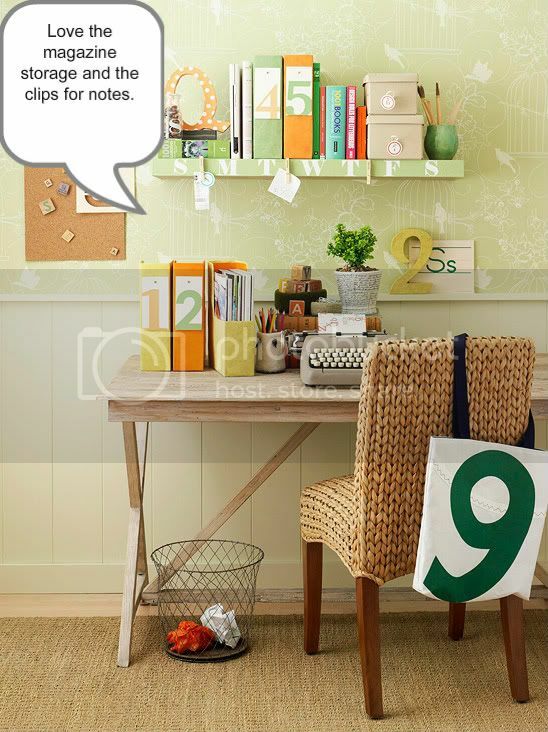 I'm not in on the getting registered part...but I am on the "cheering you got in part"
Second-- I like all your inspiration photos for you little office/desk space. I like the numbered boxes in the first picture...for periodicals or folders. 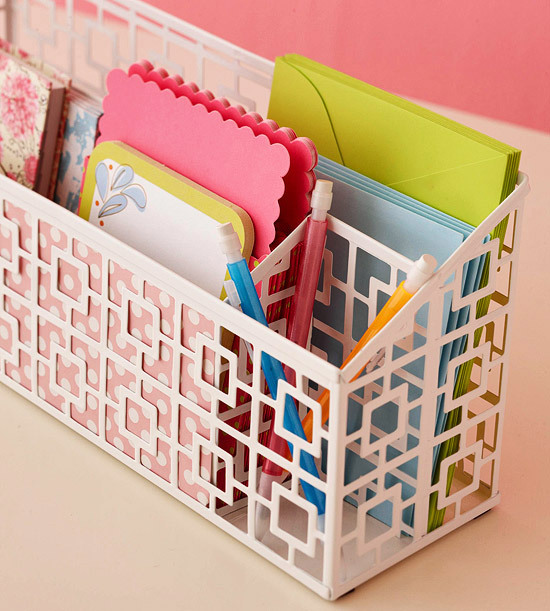 Those are cute and you can do those really inexpensively with cereal boxes, covered in contact paper or scrapbook paper. I'm sure you'll think of something with out a lot of expense. I look forward to seeing some of the great storage ideas you come up with for your home office area. I love the inspiring photos you posted! I need to better organize my desk area. It is in our kitchen, so it is exposed to the whole downstairs! I am happy your daughter got the class she needed. My daughter is having the same problem with French class. Foreign language is required, and she has already had four years of French, so she does not want to tackle another foreign language. She called me today in tears! Some great ideas. We solved the problem of cords by using an all in one computer on my kitchen desk. Everything is wireless except for the one plug behind it to plug it in. You can't see the cord. I can't wait to see what you do with this space. Love the inspiration photos ♥ blessings on your project. I'm setting up a work spce for myself too. So I'm loving the ideas you've shared! I can't wait to see what you do with your area! You have a beautiful desk. I like the inspiration of the third photo. I hope your project goes well, and your space will become something that inspires you! congrats to your daughter for getting that last class....Registration can really be a headache! There is a cord hider you can get at Home Depot. They run along the bottom part of the wall and can be painted to match your wall. I can't wait to see how it turns out. Great inspiration photos - looking forward to seeing your finished project!! Great inspiration for your little office area. I'm sure it will look adorable when it's done. Glad your daughter is all set. I remember standing in long lines for college registration and hoping my class wouldn't be full when I got to the front! PS I'm also a new follower! I LOVE the 3rd one, the green one...everything about it!!!! Try IKEA, and you are SOOOOO lucky to have it right there by you...they have tons of ideas and cheap storage stuff!!! 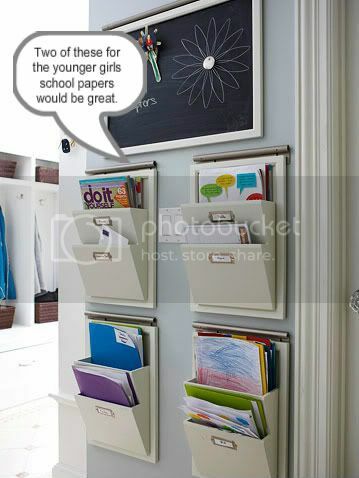 Im heading out there next week to find some ideas for my craft room...awesome stuff!!! and did I say CHEAP!!!! Your inspirations are great! I am looking too into finding a great way to keep things in order but in a cute way. I did find where you could use pipe insulation to house the cords - you could paint the outside or use contact paper to decorate it - it is a dark grey! Thanks for sharing with Home and Garden Thursday! I love your desk! I was helping my oldest with college and I think the advisor took over the job! Thank goodness! Thank you for joining me at Home Sweet Home!